SALT LAKE CITY – The University of Utah men’s tennis team (9-2) defeated the 70th-ranked BYU Cougars (5-6) Saturday by a score of 5-2 at the Eccles Tennis Center. The upset marked Utah’s first victory over BYU since 2009. Utah began the match with a set of strong wins in doubles action. Senior Alejandro Medinilla and sophomore Matt Cowley downed Robin Pfister and Matt Pearce at the No. 3 position, 8-3. Seniors Devin Lane and Ben Tasevac then followed with an 8-5 victory over Jeremy Bourgeois and Sterling Galli at the second slot. Juniors Slim Hamza and Cedric Willems were up 7-4 in their set at the No. 1 spot against Francis Sargeant and Andrey Goryachkov, but with the doubles point in hand for the Utes, the set went unfinished. With a 1-0 advantage going into singles play, Medinilla quickly put the Utes up 2-0 when he routed Pfister at the No. 3 slot, 6-4, 6-1. The Cougars then saw their first point when Willems dropped a 7-6(5), 6-4 decision to Bourgeois at the No. 4 spot, making the score 2-1 in favor of the Utes. Soon after, 87th-ranked Hamza was defeated by 91st-ranked Sargeant, 7-6(6), 6-4, at the No. 1 position. 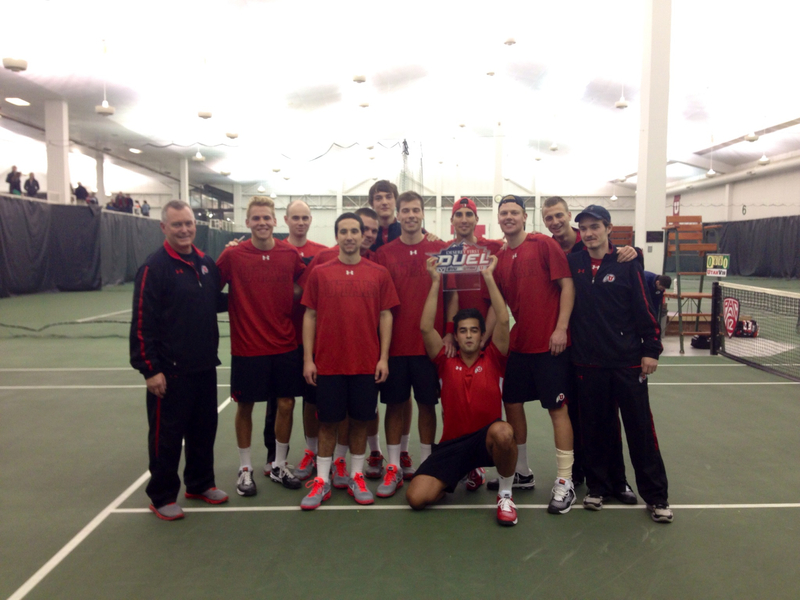 Lane put Utah back up 3-2 with a 6-2, 6-7(4), 6-1 victory over Pearce at the No. 5 slot and extended his win streak to seven. After netting a 6-1 win in his first set against Goryachkov at the No. 2 spot, Tasevac struggled in the second set, falling 6-7(5). But the Ute returned valiant and captured a crucial 7-5 victory in the third set to clinch the match deciding point for Utah at 4-2. Cowley then completed the 5-2 win for Utah when he topped Jacob Sullivan at the No. 6 position, 6-7 (4), 7-6(4), 6-1 and posted his seventh-straight singles victory. The Utes will enjoy a weekend off before heading to Lincoln, Neb., to face Nebraska and Drake March 7 and 8. 1. Hamza/Willems (Utah) vs. Sargeant/Goryachkov (BYU), 7-4, dnf. This entry was posted in Schedule/Results and tagged Alejandro Medinilla, Ben Tasevac, BYU, Devin Lane, F.D. Robbins, Matt Cowley, Slim Hamza, Utah Utes. Bookmark the permalink.